MANILA, Philippines - Rescuers scrambled Sunday to deliver food and water to hundreds of villagers stuck on rooftops for days because of flooding in the northern Philippines, where back-to-back typhoons have left at least 59 people dead. Typhoon Nalgae slammed ashore in northeastern Isabela province Saturday, then barreled across the main island of Luzon's mountainous north and agricultural plains, which were still sodden from fierce rain and winds unleashed by a howler just days earlier. Nalgae left at least three people dead Saturday. Typhoon Nesat killed 56 others and left 28 missing in the same region before blowing out Friday. Nalgae was whirling over the South China Sea and heading toward southern China late Sunday afternoon, 230 miles from the Philippines' northeast coast, with sustained winds of 75 miles per hour and gusts of 93 mph, according to the Philippine government weather agency. China's National Meteorological Center urged people in areas expected to be lashed by rainstorms in the next three days, including on southernmost Hainan island and in eastern Taiwan, to stay indoors and cancel large assemblies, China's official Xinhua News Agency reported Sunday. Nalgae's ferocious winds set off a rock slide in the northern mountain province of Bontoc in the Philippines on Saturday, causing boulders to roll down a mountainside and smash a passing van, where a passenger was pinned to death and another was injured, police said. In northern Tarlac province's Camiling town, a man sought safety with his two young nephews as flooding rose in their village Saturday. But one of the children was swept away by rampaging waters and drowned, while his uncle and his brother remained missing. A drunken man drowned in flooding in a nearby village, provincial disaster officer Marvin Guiang said. Nalgae roared through parts of Luzon that had been saturated by Typhoon Nesat, which trapped thousands on rooftops and sent huge waves that breached a seawall in Manila Bay. Nesat then pummeled southern China and was downgraded to a tropical storm just before churning into northern Vietnam on Friday, where 20,000 people were evacuated. Seven towns north of Manila were still flooded Sunday, including Calumpit in rice-growing Bulacan province, where hundreds of residents remained trapped on rooftops in four villages for the fourth day, many desperately waving for help. Rescuers aboard rubber boats could not reach them because of narrow alleys. Two air force helicopters were ordered deployed to drop water and food packs to the marooned villagers, officials said. Calumpit Mayor James de Jesus said floodwaters were receding later Sunday, sparking hope the crisis would end sooner. Local leaders have been asked to help distribute relief supplies to residents in areas in the four villages that could now be accessed, he said. "It's still critical. 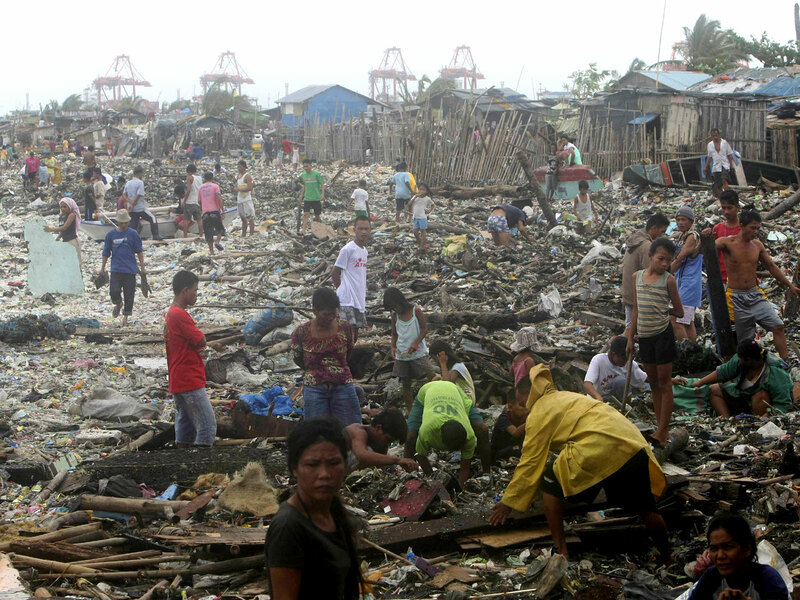 There are still houses which could not be reached," de Jesus told DZBB radio. Benito Ramos, who heads the Office of Civil Defense, said he was concerned that freshly dumped rains by Nalgae may flow down from the mountainous north to the central Luzon provinces of Bulacan and Pampanga, which act like a catch basin, especially during high tide in nearby Manila Bay. Some officials said water released from nearby dams had exacerbated the floods. Ramos criticized those villagers who refused to leave their flooded homes despite orders to evacuate. During a nationally televised meeting with disaster response agencies, President Benigno Aquino III ordered authorities to study how villagers and fishermen can be forced to follow storm warnings to prevent casualties in the future. In the last four months, prolonged monsoon flooding, typhoons and storms across Southeast Asia, China, Japan and South Asia have left more than 600 people dead or missing. In India alone, the damage is estimated to be worth $1 billion. Several studies point to an intensification of the Asian summer monsoon rainfall with increased atmospheric carbon dioxide concentrations, according to the state-run Indian Institute of Tropical Meteorology. Still, it is not clear that the damaging weather is entirely due to climate change, it said. The damage on agriculture and infrastructure from the earlier typhoon in the Philippines was estimated at $200 million. Rice and vegetables could be obtained from the country's south in case of supply shortfalls due to damaged farms and blocked roads in the north, officials said. Nalgae was the 17th weather disturbance this year to batter the disaster-prone Philippines, which is lashed by about 20 storms and typhoons annually. A low pressure area has been monitored 435 miles off the archipelago and could either dissipate or strengthen into another storm in the next few days, forecaster Gener Quitlong said.